Day two was long, but action-packed. Our service station got lots of visitors today. 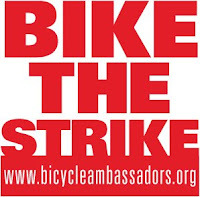 People came by to get their tires pumped up, a cup of joe, safety tips and our new Bike The Strike stickers! Please come by tomorrow from 9am-5pm to check it out and/or l ock your bike up at the bike corral. At 10am, Mayor Nutter held a press conference right next to the Service Station to congratulate District Attorney-Elect Seth Williams. This gave us a chance to give Mayor Nutter our new Bike the Strike sticker, which he proudly wore. Breen Goodwin, Education Director for the Coalition was also able to meet and greet with Police Commissioner Ramsey to speak briefly with him about enforcement, safety and bike theft! Bicycle Coalition staff and volunteers also did bike counts on Walnut Street Bridge and on 22nd and 21st Streets. We will release the results tomorrow.